We just got back from our big trip of the year, a combination conference, family visit, and vacation in Paris and Versailles. 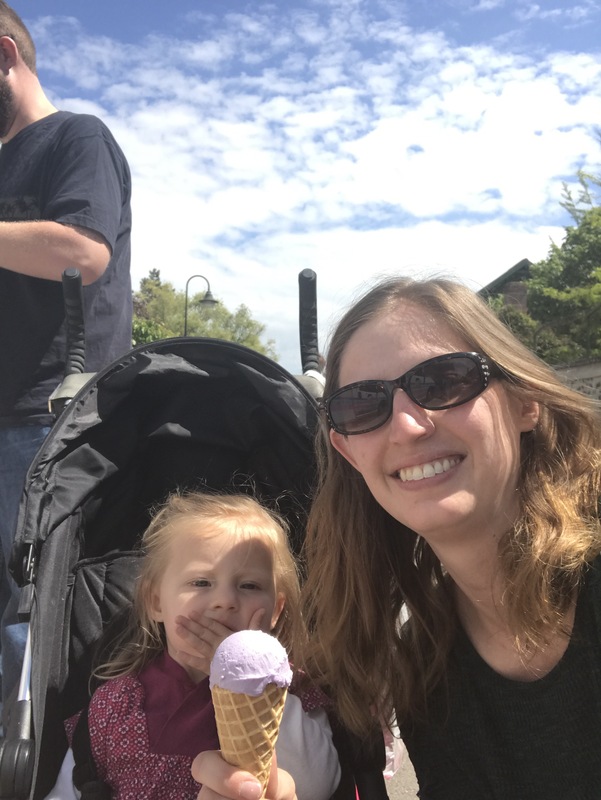 There are so many things I could write about – the amazing meals, the sweet time with family, the blessings and kindness that we encountered at every step, how our second trip differed dramatically from our first, and toddler travel. But today I will write of Monet. He was a father of Impressionism (it was named for his painting, Impression, Sunrise). 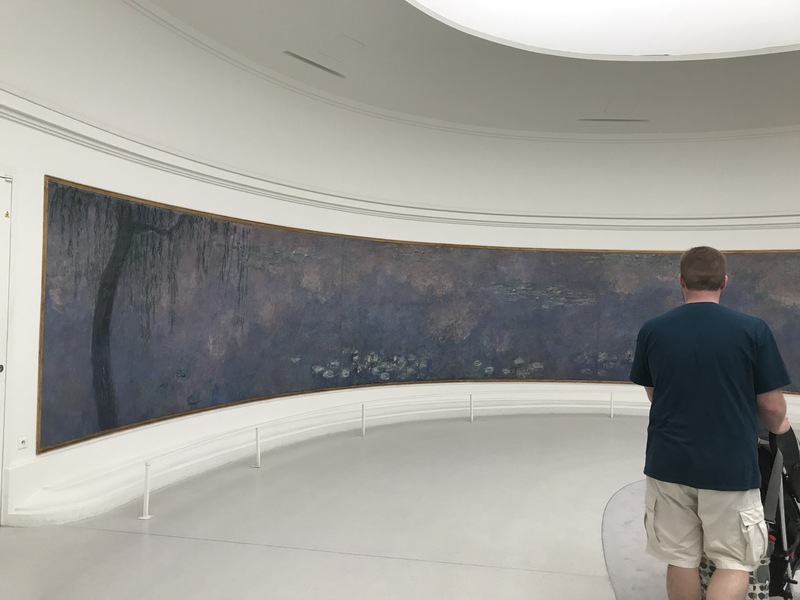 We saw many Parisian museums last time; this time, toddler in tow, we only visited L’Orangerie, home of Les Nymphéas (the water lilies). Outside, the afternoon sun is brutal. The toddler is overtired and crying, crying. I circle quickly through the cool crowded downstairs galleries of Impressionists. There is an exhibit of art from Ishibashi, the Japanese founder of Bridgestone, who collected Impressionist art. The toddler falls asleep and Chris rejoins me. We wander through the galleries again, enjoying the new and the familiar. We finally decide to visit the Water Lilies. We walk into the great rooms crafted to display them, designed to have the best light. They are huge! I expected walls full of small canvases. These are vast, they are magnified. These are a journey, from tree to tree, over reflections, ripples, lily pads. Different panels show different tints, different lights. The toddler wakes up, querulous; we leave quickly. 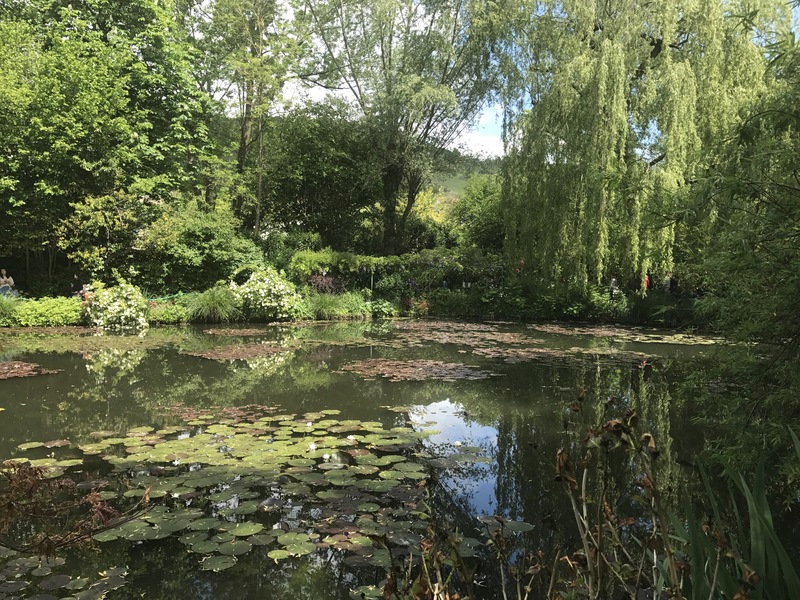 After that we had to see Giverny, Monet’s home for many years. After the death of his first wife, Monet and Alice, his eventual second wife, and their large blended family set up shop in the rolling French countryside, where Monet created and painted fantastic gardens. We find our way along winding roads by the Seine, through narrow streets in red roofed towns. Monet saw this place from a train. It happens that way, finding a home. I buy tickets while Savannah naps in the car. A little girl bumps into me and her mother scolds her in an unknown language, perhaps Portuguese; she says “sorry” and I smile at her. We have a French picnic by a carp pond – cheese, a baguette, a coffee for me, Orangina for Chris. We walk to the museum. 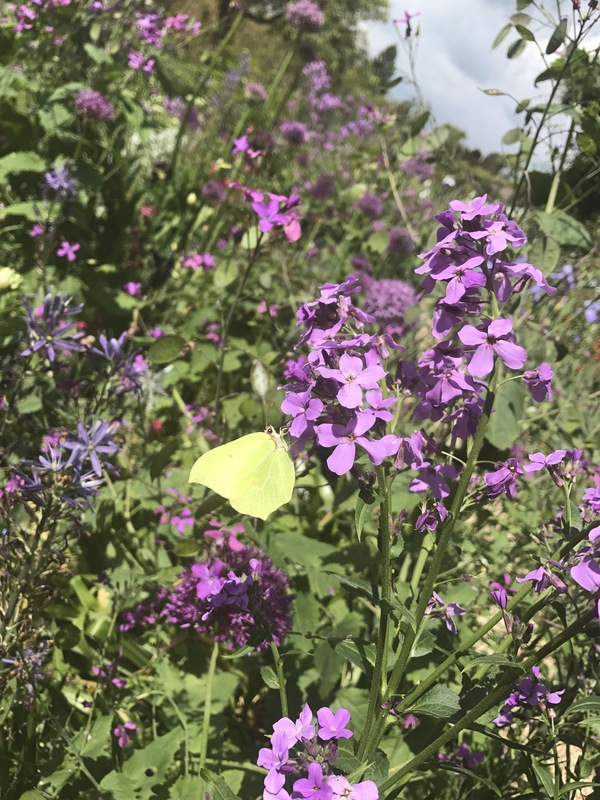 The formal gardens are a profusion of flowers in full sun, alive with insects. We wander through the tunnel to the Japanese garden. We are very good at converting the stroller into a litter for the stairs. The pond water is still, green; a bevy of frogs begin a chorus of croaking and stop just as suddenly. The bridges are hung with wisteria and crowded with tourists. It is shady, ethereal, magical. We leave reluctantly – we have another museum to visit, and are looking forward to an evening in Paris with our French famille. But first, an impulse buy at the gelato cart. Of course, I have to get violet.